December 28, 2018 Yaquis de Obregon placed RHP Manny Corpas on the reserve list. December 14, 2018 RHP Manny Corpas assigned to Yaquis de Obregon. December 11, 2018 Venados de Mazatlan placed RHP Manny Corpas on the reserve list. December 5, 2018 Venados de Mazatlan activated RHP Manny Corpas. November 30, 2018 Venados de Mazatlan placed RHP Manny Corpas on the reserve list. October 9, 2018 RHP Manny Corpas assigned to Venados de Mazatlan. May 1, 2018 Algodoneros Union Laguna signed free agent RHP Manny Corpas. October 6, 2016 RHP Manny Corpas assigned to Bravos de Margarita. February 17, 2016 Guerreros de Oaxaca released RHP Manny Corpas. December 10, 2015 Naranjeros de Hermosillo placed RHP Manny Corpas on the reserve list. November 28, 2015 RHP Manny Corpas assigned to Naranjeros de Hermosillo. July 15, 2015 Diablos Rojos del Mexico traded RHP Manny Corpas to Guerreros de Oaxaca. April 2, 2015 Diablos Rojos del Mexico signed free agent RHP Manny Corpas. November 14, 2014 RHP Manny Corpas assigned to Leones del Caracas. July 13, 2014 Colorado Springs Sky Sox released RHP Manny Corpas. April 2, 2014 RHP Manny Corpas assigned to Colorado Springs Sky Sox. February 4, 2014 Colorado Rockies signed free agent RHP Manny Corpas to a minor league contract and invited him to spring training. November 12, 2013 RHP Manny Corpas assigned to Bravos de Margarita. October 17, 2013 RHP Manny Corpas elected free agency. September 3, 2013 Colorado Rockies recalled RHP Manny Corpas from Colorado Springs Sky Sox. August 17, 2013 Colorado Rockies optioned Manny Corpas to Colorado Springs Sky Sox. June 2, 2013 Colorado Rockies selected the contract of Manny Corpas from Colorado Springs Sky Sox. January 9, 2013 Colorado Rockies signed free agent RHP Manny Corpas to a minor league contract and invited him to spring training. October 26, 2012 RHP Manny Corpas elected free agency. June 6, 2012 Chicago Cubs selected the contract of RHP Manny Corpas from Iowa Cubs. January 26, 2012 Chicago Cubs sent Manny Corpas outright to Iowa Cubs. December 26, 2011 Chicago Cubs signed free agent Manny Corpas. November 2, 2011 RHP Manny Corpas elected free agency. September 21, 2011 Round Rock Express activated RHP Manny Corpas from the 7-day disabled list. May 3, 2011 Texas Rangers signed RHP Manny Corpas. May 3, 2011 RHP Manny Corpas assigned to Round Rock Express. 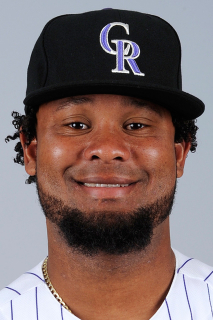 November 16, 2010 Colorado Rockies released RHP Manny Corpas. November 2, 2010 Colorado Rockies activated RHP Manny Corpas from the 60-day disabled list. September 18, 2010 Colorado Rockies transferred RHP Manny Corpas from the 15-day disabled list to the 60-day disabled list. December 1, 2009 RHP Manny Corpas assigned to Leones del Escogido. November 6, 2009 Colorado Rockies activated RHP Manny Corpas from the 60-day disabled list. July 24, 2009 Colorado Rockies placed RHP Manny Corpas on the 15-day disabled list retroactive to July 21, 2009. Right elbow inflammation. July 16, 2009 Colorado Rockies activated RHP Manny Corpas from the 15-day disabled list. July 8, 2009 Colorado Rockies sent RHP Manny Corpas on a rehab assignment to Colorado Springs Sky Sox.